The Official Google Blog gives details: "Latitude is a new feature for Google Maps on your mobile device. 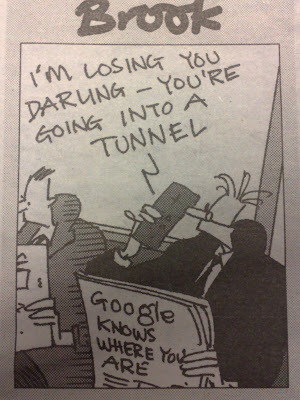 It's also an iGoogle gadget on your computer. Once you've opted in to Latitude, you can see the approximate location of your friends and loved ones who have decided to share their location with you. So now you can do things like see if your spouse is stuck in traffic on the way home from work, notice that a buddy is in town for the weekend, or take comfort in knowing that a loved one's flight landed safely, despite bad weather. And with Latitude, not only can you see your friends' locations on a map, but you can also be in touch directly via SMS, Google Talk, Gmail, or by updating your status message; you can even upload a new profile photo on the fly. It's a fun way to feel close to the people you care about." However, the idea of using a mobile phone as a location tracker is not new. Since 2005 Japan have had mobile phones that offer this sort of service - even when they are turned off. Primarily used for keeping track of children, the Japanese 'imadoco' (translated as 'where are you now?') location tracking service is well established. 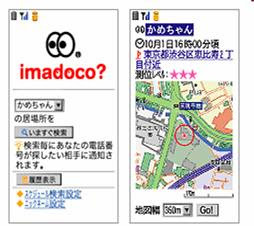 "The imadoco service lets you use i-mode or a PC to get maps showing where loved ones are. Highly accurate location information is available on maps if the person you are looking for has a GPS-compatible FOMA handset. Even if the other person does not have a GPS-compatible FOMA handset, you can still get maps with approximate location information acquired from base stations." So if versions of this technology are widely used in the Far East, is Metro's 'spy in your pocket' headline for Latitude an over-reaction? 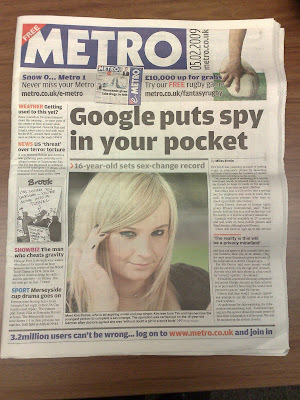 Surely location based ads are Google's natural next phase for Latitude? As Google have not been able to cut it with accurate IP targeting, this looks like the only route to serve location based ads - though typical Google to brush it up as a social solution. Though, if people are freaked out by the likes of behavioural targeting/Phorm-like platforms, they won't be best pleased to give themselves up for Google. I won't be giving Latitude the time of day, some things need to stay private! Nick, I found your blog while looking for some twitter data to throw in a college students face, except when I got to the end of your post, I found she was somewhat right. But just wanted to add, you have some nice content on the site and as far as Latitude goes, it's a severe crimp in companies that are trying to or are selling external LBS devices.